Realistic looking Male long neck Mannequin Head. This Life-Like looking Mannequin Head is perfect to display hats, scarfs, sunglasses and jewellery. Male, Kids and Abstract Mannequins, Torso and Display Heads. Essential and perfect item for practice make-up Self-Practice before Trying it on a face of Real Person CANNOT stand alone, perfect to set up on a table or board The clear acrylic display shown in picture is NOT included More shop displays available in our store Direct factory: low price good quality Wholesale discount or custom order, please contact us for details?? Type Fashion Display Function Organizer MPN Does not apply Brand Unbranded EAN Does not apply UPC Does not apply ISBN Does not apply. Styrofoam Foam Mannequin Wig Head Display Hat Cap A Great Tool for Your Precious Wigs or Hats!! Color: White Height: Approx. 11.25 inch / 28.5 cm Head Circumference: Approx. 21 inch / 53.5 cm Material: Foam Quantity: 1 pcs Package Contents: 1 x Foam Head Glasses Hat Display Model Mannequin Note: Light shooting and different displays may cause the color of the item in the picture a little different from the real thing. Head Mannequin Dummy Adjustable Detachable Display Showcase. High quality female Head realistic mannequin. Female Material: PE plastic. First-class detail makeup. Head Length:18cm. Local pick up is not available. Female Styrofoam Mannequin Manikin Head Model Foam Wig Hair Hat Glasses Display. Mannequin Type:Head. 2 X Foam Mannequin. Mannequin Type Head. Material: Foam. Optics Compact Reflex Red Green Dot Sight Scope 4 Reticle for Hunting AU. Realistic looking Female Mannequin Head with Shoulders. made out of Fiberglass - LifeLike Appearence ! This Life-Like looking Mannequin Head is perfect to display hats, scarfs, sunglasses and jewellery. The filling degree is good, no pits, smooth body mould. Pure hand-made makeup, professional make-up artist to do the makeup, which let the head mould more glorious. Copper mould is good, and the model’s head doesnot have any incomplete point block. Features: Female Styrofoam Mannequin Manikin Head Model Foam Wig Hair Hat Glasses Display 100% brand new and high quality Specifications: Condition:New Color:White Material: Foam Diameter:app 16cm/6.29" Height:app 27cm/10.63" Quantity:1Pc Net Weight: 57g Weight: 67g Package include: 1 X Foam Mannequin Brand Unbranded MPN Does Not Apply UPC Does not apply EAN Does not apply ISBN Does not apply UPC Does not apply. 1 Piece Mannequin Head. - Type:Display Head Model. - Head circumference:approx. - Shoulder Wide:approx. - Our Model has special design ,the female dressed in rose red cloth,vary charming and fashion. 53cm around the forehead. Made from styrofoam. We will always here to solve them for you. It won't help the problem to be solved. Both the arms and head of the mannequin are adjustable to different angles to create different looks and poses. Height: 175cm. Full Body White Female Mannequin. Black Boston shaker set. 1 x Full Body White Female Mannequin. Durable Foam Mannequin Male Head Model Dummy Wig Glasses Hat Display Stand Black. 1pc Wide Brim Outdoor Activities Fisherman Fishing Hiking Camouflage Bucket Hat. Slender Fingers Female Hand Modeling Bracelets Jewelry Exhibit Display Accessory. 40 d ifferent styles of show cases and 10 slat walls. 3 0 different styles of unbreakable plastic mannequin displays. Female Mannequin Head. 60 d ifferent styles of mannequin heads. Height: from top to bottom 18". Both the arms and head of the mannequin are adjustable to different angles to create different looks and poses. Colour: White. Adjustable arm level to achieve different poses. Perfect for fashion clothing and accessories display. High simulation of human head shape make it easily put pins on and hold the wigs. Hole on the bottom can be easily fix on the mannequin holder or clamp, can also be used with any holder for upright use. Features: 100% brand new and high quality. Surface is smooth and it is easy to clean. Do not fade, easy maintenance. It used to display hats, scarves, hair, hair, etc. Specifications: Material: bubble Color: white Size: 21*13.5*37cm Package included: 1 x Mannequin Head Notes: 1. Female Styrofoam Mannequin Manikin Head Model Foam Wig Hair Hat Glasses Display. Foam Mannequin Mannequin Type:Head. 1 X Foam Mannequin. Type Foam Mannequin. Mannequin Type Head. Material: Foam. Function : For Wigs ,Jewelry ,Hat display. Head Circumference: 54cm. Because we work on very low margins. Addition information We'll acceptmoney orders ,bank deposit, andbank cheque. We just got a whole container of ne w Mannequins. Male, Kids and Abstract Mannequins. Matte Black M ale Full-size MUSCULAR Mannequin with EGGHEAD ! Mannequin is still in box, has never been displayed ! Both the arms and head of the mannequin are adjustable to different angles to create different looks and poses. Height: 175cm. Full Body White Female Mannequin. 1 x Full Body White Female Mannequin. 1x Mannequin Head. We will always here to solve them for you. It won't help the problem to be solved. Material: PVC (Non-toxic plastic PP). Head gender: Female. Ideal for wigs, sunglasses, Jewellery, hats, headphones, etc. The mannequin head is well constructed of 3 assembled parts: head, neck and bottom. The woman head is made of Eco-friendly PE. Colour: Light Skin Type and beautiful makeup ( See Photos). Shoulder Width: 27 cm. Made from styrofoam. We will always here to solve them for you. It won't help the problem to be solved. 53cm around the forehead. 53cm around the forehead. Made from styrofoam. We will always here to solve them for you. It won't help the problem to be solved. Height: 26cm. 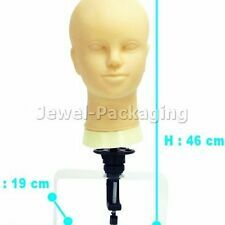 This mannequin head is made of high quality material, which is lightweight and durable. High simulation of human head shape make it easily hold the wigs and hats. High simulation of human head shape make it easily hold wigs and hats. Features: 100% brand new and high quality. Do not fade, easy maintenance. Surface is smooth and it is easy to clean. It used to display hats, scarves, hair, hair, etc. Specifications: Material: bubble Color: white Size: 19*12. Features: It is a female styrofoam mannequin manikin head model foam wig hair hat glasses display The material is very durable and high grade. Perfect to display wigs, sunglasses, hat and more. Easy to use and to operate at affordable prices. It is so stable and can use for a long time. MANNEQUIN HEAD FOAM --. Solid Construction Display Stand. IDEAL FOR WIGS, SUNGLASSES, JEWELERY, HATS, ETC.